Transportation • Sales tax would rise by a cent per $4 spent in areas that approve it. Al Hartmann | The Salt Lake Tribune Newer model UTA buses leave the Salt Lake Central Station at 250 S. 600 W. in Salt Lake City Monday Ocotber 12. Al Hartmann | The Salt Lake Tribune Recently redone and updated stretch of 5300 South from I-15 to Redwood Road is up and running last week. If voters approve Proposition 1, it will generate $57.84 million more in sales-tax revenue each year for transportation in Salt Lake County. That&apos;s according to new county-by-county estimates released Tuesday by legislative fiscal analysts. Prop 1 would raise sales taxes by a penny for every $4 in purchases. 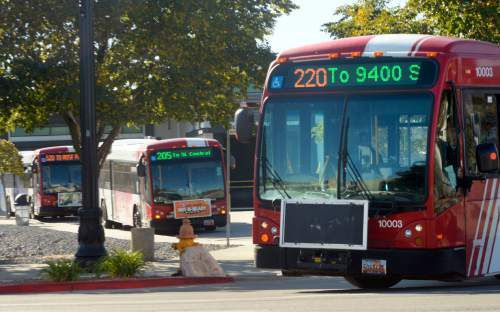 In Wasatch Front counties, 40 percent of the money would go to the Utah Transit Authority. Another 40 percent would go to cities and unincorporated area service districts for roads, bike lanes, trails and other projects. And 20 percent would go to counties for transportation projects of regional significance. In areas without a transit district, 60 percent of the money would go to counties. Seventeen of Utah&apos;s 29 counties have put Prop 1 on the Nov. 3 ballot, including all large Wasatch Front counties. • Utah County sales-tax revenues would increase by an estimated $18.3 million a year, about $32.64 per resident. 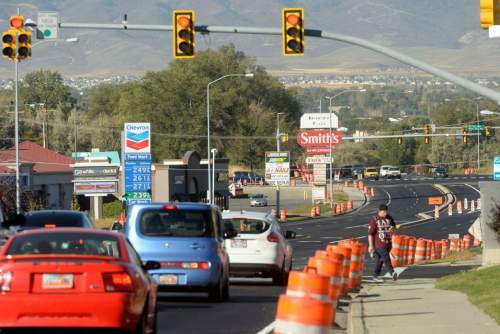 • Davis County revenues would increase by $11.1 million, about $33.62 per resident. • Weber County would see revenues increase by $9.1 million, about $37.85 per resident. Legislative analysts figure Prop 1 would bring in about $108 million a year if it passes in all 17 counties that have it on the ballot  meaning Salt Lake County would see a bit more than half of the total increase statewide. How much Prop 1 would cost each individual depends on how much he or she spends, including on high-cost items such as cars. Analysts wrote: "A family of four spending, say, $20,000 on nonfood taxable items will see a tax increase of about $50 per year. A household spending, say, $100,000 on non-food taxable items will see a tax increase of about $250 per year." Analysts said if Prop 1 passes, it would increase the average sales-tax rate statewide to about 7 percent. That would rank No. 25 among the states. But tax rates vary greatly by city and county, and sales-tax rates in Salt Lake County would be higher than that average statewide. For example, the general sales tax now in most cities in Salt Lake County is 6.85 percent  and Prop 1 would raise that to 7.1 percent. Sales tax is currently a bit higher in Murray and South Salt Lake, at 7.05 percent (which would go to 7.3 percent with Prop 1), and higher yet in the resort town of Alta, at 8.35 percent (which would go to 8.6 percent). Sales tax on unprepared food is 3 percent and would not be affected by Prop 1. Legislative analysts also estimated how much all tax increases authorized by the Legislature this year would cost typical families. Besides allowing counties discretion to put Prop 1 on the ballot, the Legislature passed a $75 million property tax increase for schools and raised gasoline tax by about 5 cents a gallon, effective Jan. 1. For Salt Lake County, analysts figure those three taxes combined would cost an average family about $140 a year  $50 for Prop 1, $47 for the property tax increase for education and $42 in increased gasoline taxes. That estimate is for a family that owns a $250,000 home, earns $50,000 a year and drives 13,000 miles annually, analysts said.